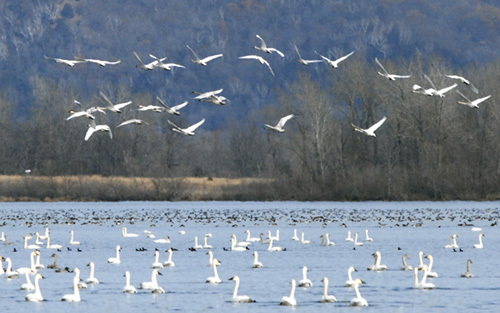 Tundra Swans have arrived on the Mississippi River near Brownsville in southeastern Minnesota. This is an annual refueling spot as the birds migrate from nesting territory in northern Canada to wintering grounds on Chesapeake Bay in Maryland. Now’s the time to plan a trip if you want to witness one of our truly spectacular birding events. It would make a nice Thanksgiving weekend trip. An estimated 1,000 swans were there on Nov. 12. The cold and possibly stormy weather this weekend should bring thousands more. The birds usually stay until these feeding grounds freeze. Observers also report White Pelicans and many ducks. To find the birds, follow Highway 61 down river. Brownsville has two lookouts where you can see birds, sometimes visit with a naturalist, and find convenient parking. Parking along the highway is dangerous.